Nice to see PowerSlide continuing to innovate. I had their SUV frames a few years ago and they were very nicely made. As a matter fact, they are still for sale! The fundamental difference I see here is they went from 125mm pneumatic tires up to 150 mm. 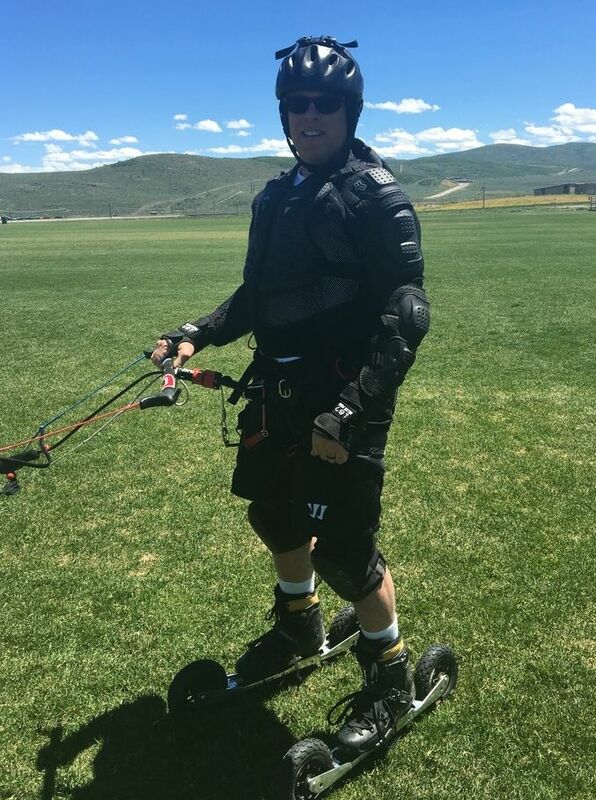 That's a good change IMO particularly for kite skating as we would want to be on rough surfaces and this added size will come in handy. Their tires, while large at 150 mm tall still seem narrow to me for kiting (eyeballing them I'd guess they are 25 mm wide). I'd love to see somebody go into production with a skate and frame like this but go widebody and get three 150 x 50 mm tires underfoot. Two ways to go here: 3 underfoot or 2 one on each end (wheels of doom style). Advantage of 3 under is maneuvering while 2 front and back lowers CG and are great for setting a long tack line. Gotta step turn wheels of doom and pray you don't blow the ligaments out in your knees. If I had it to do over again I'd be looking for 3 underfoot at 150 x 50.
the same on overhead view. The inner boot liner is likely way better than the Coyote-which was crap! I replaced the coyote's bootie with a heat moldable, firm foamed one(from Telemark ski boot) that made a HUGE difference for body alignment/ lateral balance. If inner boot is to thin ,soft or 'squishy' your foot may move or drift off-centered within the extra width of the shell( that allows an inner boot to fit in) , and misalign your knees and such-as Coyote originals did to me. Wider wheels would be needed for grass(short cut or mowed) which is where you rode before Steve, I believe. You are correct Tuck, I was mostly using my skates on very thick, plush grass athletic fields. There the 125x25 mm PowerSlide SUV setup didn't cut it at all. The 150 x 25 mm would likely be a slight improvement but not as much as more width would have been. My 150 x 50 mm wheels of doom worked well on that grass right up to my freak gasoline fight accident (but I can hardly blame the skates for that). I used both setups on Ivanpah too and didn't much like the feeling of my fillings rattling out of my teeth with the Pwerslide setup. Better with the Wheels of doom. The Powerslide's 125 x 25mm tire might work for the hardpack sand.... but most likely not as well. One would have to try to see how much less on this specific(hardpack sand) terrain. They don't try either on beach in this, unfortunately. Thanks Tuck. Actually, I am very pleased to report that I got to buggy on the beach a couple of weeks ago with our Pacific Northwest and Canadian brothers at Fall SOBB. That was special! A whole new world, and a great one at that! Way beyond just the beach, the SOBB community is TOPS. ..got to buggy on the beach a couple of weeks ago with our Pacific Northwest and Canadian brothers at Fall SOBB. That was special! A whole new world..
Oops. Sorry, Steve. Never Paroozed much onto the Fall SOBB thread at all or would have known. Beach hardpack has to be the best surface you could buggy on...huh? Glad you experienced it. .... And did you imagine being on Coyotes or SUV's and what it'd be like...instead of grass? Bladerunner (Ken2) was in the SOBB house and represented with his Coyotes on the hard pack. Course it pales to seeing him rip a wing on Ivanpah in 30+ winds. Balls like bull. At SOBB he was rockin' a gigantic Arc. Agree completely that hard pack sand is a fantastic kite buggy surface. Powerslides, fun water obstacles, breathtaking beauty, kind to kites, and easy to secure kites with just a few well placed handfuls of sand. What's not to like? I have two pairs of coyotes with extra tires and tubes if anyone wants them. No land kiting where I live so they are just clutter for me. Any reasonable offer accepted. Too many kites, boards, and etceteras. 7 and 11s. I'm size 11.5-12 in street shoe and the 11s fit fine. You can also just bolt the track to another rollerblade boot, it's a direct fit at least with older models. I also have spare tires and tubes for these.